Our words are too complicated. Let's make them simpler! TL;DR: Our wording is complex, and hard for people from other languages to read. Let's make it simpler. Seriously, though, at least read my example at the bottom. For a long time, I've noticed a trend: People from certain countries (which I will refer to, collectively, as Elbonia) seem to 'ignore the rules' more than people from other countries. I've never been content just blaming the people, or putting a broad blanket on it. That's an easy way to put the blame on someone else - a group of people, actually. "Those Elbonians just can't get it." You were born and raised in Elbonia, and thus were only exposed to the native language from birth. Furthermore, Elbonian has a vastly different structure than English does. One day, you decide you want to start programming. You find Stack Overflow, but discover everything is in English. So you start taking English classes (or just try to pick it up as you go). This is probably very hard for you - you're trying to learn a whole different language, with a different structure. Have you thoroughly searched for an answer before asking your question? Sharing your research helps everyone. Tell us what you found (on this site or elsewhere) and why it didn’t meet your needs. This demonstrates that you’ve taken the time to try to help yourself, it saves us from reiterating obvious answers, and above all, it helps you get a more specific and relevant answer! Remember, you have a month of English experience. If you happen to have a three year old handy, read them that and have them explain to you what it means. Luckily for you, you know what "proceed »" means. That sounds like what you want to do. You check the box and then type your question into the box. You haven't read any of the help text. You just want to get your question answered. If this isn't making sense, I challenge you to take a month of Portuguese and then read https://pt.stackoverflow.com/questions/ask/advice. Actually - try Russian. That's what it's like for these people. You might have a shot at reading that - but why would you? You have nothing invested in Stack Overflow, you just want to get your question answered. You're probably on a schedule. So you click continue and type your thing into the box, where it gets immediately downvoted and closed and deleted and whatever other bad things we do to questions. And we wonder why these folks often write 'bad' questions. I didn't leave anything I tried out of this list. There is no cherry-picking going on here. Our rules are simply hard to read. We've expected new English speakers to read 8th grade stuff - and that takes effort. 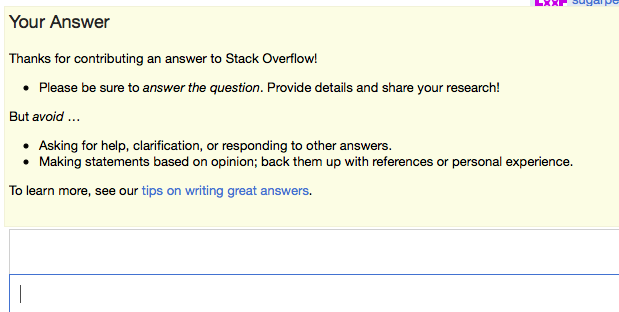 Thank you for writing on Stack Overflow! You must answer the question. Explain how you found the answer! You must not post your thoughts without facts. All answers must be based on facts. See a diff between the two versions. If we make our rules easy to read, people will be more likely to read them. This is a net benefit for everyone. To get yourself in the mood necessary for writing these, spend about 20 minutes reading Simple Wikipedia. I realize, of course, that we're a professional site. People in the US/UK/EU and other places are proficient at English. The current text is much more accurate and information-dense. I do think, though, that it's possible to write simple text in a professional way. If we have to, we could even geolocate based on IP and show different versions to different users. What are your thoughts? Is this a good idea? * These scores are not perfect. They're only intended to give a relative indication of roughly how hard something is to read. We all know how accurate machines are at natural language, so take this with a grain of salt. Cultural differences are more of a problem than specific words (that no one reads anyways). Don't fix symptoms while ignoring the root problem. And work with international teams. You will be a better person for it. The rules - who needs em anyways? Who are they for? I didn't leave anything I tried out of this list. There is no cherry-picking going on here. Our rules are simply hard to And we wonder why these folks often write 'bad' questions. This only matters if people read the rules. How many people who have ever posted to Stack Exchange have read and understand the rules as written anyways? Maybe 1% could say they've read them? The primary audience of those pages are not new users, it is the established user base. It's the guideline to be used to manage the site, guide established users, etc. It's not for new users. Until you show me statistics that more than a fraction of regular users let alone new users read the help pages I am going to assume they don't get read, nearly ever. Frankly, even as a moderator, I rarely read the pages you listed and am pretty sure that if you could look at what percentage of users end up even clicking on those links (not to mention actually reading) it would be a very, very small portion. I could probably end this post there but... I am fairly passionate about cultural differences. There are more problems than this. The cultural difference between most of the world and USA/Europe is huge. Shog pointed this out in his comment, but I want to show you how your "good example" is more problematic than you realize to many Elbonians. I work with non-native English speakers 100% (not from Europe) and this is my perspective on what you wrote. I briefly talked about #1/2 above. Let's look at faulty premise #3 next using your example. This isn't clear to me what you mean. "Your answer" - what answer? I haven't written one yet. Again, not clear. This implies that my contribution is great simply for answering. You are literally thanking them for writing afterall. This also uses "on" ambiguously. This misses a cultural gap for much of the world, where the "why/how" part of an answer is irrelevant. You know as well as I do that many people around the world want an answer and don't care about how/why. I barely understand what you mean by this as a native English speaker. This isn't a clear sentence at all and if I am not a native English speaker it will be quite confusing. ... imagine reading this as a non-native English speaker, with limited English skills, and as someone not familiar with the Stack Exchange model. What you are saying here is... not clear and not informative. "You must not post" is very strong wording specifically here, though also throughout all this, which is a turnoff to most of the world, who care about things like this. This is also badly written. You don't want to write incomplete thoughts where much of the action/verb are implied. As a native English speaker - no problem. But for non-native English speakers this can be confusing as heck. Think about this. "to learn" is an infinitive verb. "to learn more" means what exactly? why is there a comma? My point in all this is that what you are describing as the core problem is not relevant. Reducing the number of words might increase the "readability" or other useless metrics but if you start using implied phrases and "slang-like" wordings you might pass that metric test but completely fail the "how easy is it to actually read when you are a non-English speaker?" test. If you want all that to be more relevant to people in "Elbonia" start using words like "we" and more community based words. Have those from Elbonia write them instead. Also, just a note, people generally can read/understand English at a better level than speak and certainly than write. More of an observation, but important to realize. If someone is writing in mostly-broken-but-understandable English they can probably read English that is considerably more advanced than you realize. Writing fluent second languages is really hard compared to reading it. Most people posting questions to this site have considerably more English capability than your 1 month estimate. And now onto assumption (4). I had an interesting conversation with my international colleagues yesterday that relates to this and frankly is a perfect example. Several of them talked about how one really nice thing abut the USA is because people here actually obey laws. ... really? Most Americans would find this highly amusing, probably laugh and roll their eyes, but think about it. In spite of all the problems/whatever here people in other countries still feel Americans respect the law more than them. In both their countries, blatant bribery is part of their culture. You aren't going to change this cultural difference by writing nicer words that are easier to understand. Your assumption here is a fundamentally individualistic assumption. If I grow up in a country where bribery is a daily part of life and I have no respect for authority because culturally we don't respect our police and it's ok to beat them, how is some nicely worded on-off topic page going to fix that? It won't. We also talked about how in America culturally it is not expected for you to immediately ask for help or give or wait for help. Elsewhere in the world societal pressures that Westerners are completely oblivious to and ignore completely cause problems like this. This is the result of completely different cultures. I had discussions this week about how hard this is to change for employees even with a boss mandating it - better wordings will never change it. How about let's think about reputation. I had a conversation with an international colleague about the idea of reputation - how he doesn't like contributing to sites like Stack Overflow because it's not fair that it is not possible to catch people who have been here longer. This might seem like a silly reason to a Westerner, but this person does not contribute because of this. It's that meaningful to them. I could write at length about this sort of thing with example after example. Culture is different. In some cases very different. This causes us to have different expectations about how everything in the world and on the Internet works. This is where the problem lies. People dropping "need answer ASAP help plz" rather than a well formed question are not doing it because the rules are too complicated, it's because of a culture difference. Stack Exchange can make the Internet a better place. But it certainly t can't change an entire culture simply by making the about/help/how-to pages better. I don't know if there is any way I can make people realize how true this is. Westerners tend to believe that the most effective communication is clear, direct, and concise. You can see it even in your proposed solutions. But those wordings are not friendly or nice to people who are outside Western culture and are probably worse overall because of this. I strongly encourage any of you who work with colleagues across the world other than Western Europe to have this sort of discussion (assuming you have a strong relationship with them). Ask them how some of your emails sound. Have a conversation about this. You will find that optimized Western communication is really harsh/rude to much of the world. Stack Exchange is status-by-design optimized to be an efficient, lean, impersonal, machine. But have you noticed, many posts from Elbonian posters have greetings, thank you's, things that acknowledge the [site] as individuals, lots of "unnecessary details and context" in them? This is part of culture for them. It's how their entire world works. It's.... at odds with the entire premise of Stack Exchange which basically says, "HAHAHA screw you! I don't care about you as a person at all, we're doing things our way and you are going to have to do the same." If we want to "fix" the difficulties faced by Elbonians and make it more friendly/engaging/encouraging for them, changes fairly fundamental to how Stack Exchange works are required. The entire model just... isn't designed in such a way to be an easy culture fit for a large percentage of the world. It's never going to seem relational. It's never going to feel like a welcoming community for a first time poster. I love the suggestion. And I want to address one of the concerns you mention: that it will look unprofessional to people with a good command of English. There was a great article on Smashing magazine once (sadly, I couldn't find it now) about dividing features into simple ones for new users and complicated ones for power users. Their conclusion: don't do it. Why? A user who has just encountered the application will be overwhelmed by a complicated interface, they said. So obviously, they need a simple interface. But does the power user have the time to deal with the more complex one? Usually, no. The power user may have the ability to work with it. But when he sits down to use the application, he does not want to invest the time needed for doing so. He has thousands of other things on his mind, and a deadline. Now, that's oversimplified, as it leaves out the situations in which an advanced interface is advantageous (hint: when flexibility increases the application's value). But this is not one of those situations. What we have here is users who need help, and will click away whatever stands in their way. They're not going to read a wall of text even when it's not hard for them. Sure, the current text looks more polished, and contains more information. But it does not convey more information, because I bet most users don't read it. At least many of them act like they did not. My vote: Turn the simple text on. Without geolocation. This is an interesting idea. It's well-formed, well-presented and well-argued. But after thinking long and hard, I couldn't support it. If someone can't read our rules, then how are they going to post a well-written question? How are they going to understand a well-written answer? One might argue that a post, simple enough to be understood by someone with no better grasp of English than that of a Year 4 schoolchild, is extremely unlikely to be interesting, novel or useful. If it is, don't we still want it? Yes, I suppose; the OP's broken, child-like grammar could be improved by others through editing. That's fine. But is "allowing" this really worth dumbing down all of the site's meta-content, especially when you consider that we're not actually talking about "allowing" anything: we are talking about actively encouraging it. I don't think that sends the right message about our quality standards, and I don't think it sends the right message about why we're all here. For instance, this whole thing you mention of "you just want to get your question answered. You're probably on a schedule" is often true, but is completely not how we want people approaching their community contributions here. It's not a helpdesk. A well-curated repository of Q&A, generated by real-world need but constructed with that particular end goal in mind, is ultimately far more helpful in general than some message board with reams of "hi i hav problm code wont compile i did try trning comp on n off but no luck plz help". And part of a well-explained, well-thought-out problem description is that it has been presented in mature, technical language. Are we potentially turning away people because their English isn't that good yet? Either because they decide not to bother when faced with all that meta-content of warnings and requirements, or because their question was closed within seconds? Yes, we are. Is that a problem? No. Their urgency isn't our problem. They may come back in a few months' time with a better grasp of the language. They'll then also find that they are far more effective developers anyway, both in their coding and in their interactions with the wider industry. If we dumb down the Stack Overflow meta-content, we're saying that none of this matters. And I think that's the wrong message to send. Not to mention, it looks more Fisher Price than professional Q&A! Incidentally, I do think there is actually a logical flaw buried in the reasoning behind your proposal, which is where you equate "adult who doesn't know much English yet" to "3 year old child". Being new at one language and being new to the entire world are not the same thing. Life experience gives you unimaginably useful pointers and context when trying to learn a new language (or to understand a passage of text in a language you don't yet know very well) as an adult (or, perhaps, a teenager). For example, just knowing how internet communities tend to work, or being aware of basic social etiquette. A three year old does not have any of this, so the comparison is entirely unfair. I do think that your general point is pretty reasonable and it might not hurt to lose some of the longer words where they are simply unnecessary. I mean, that would just be polite to an international audience. But let's not bend over backwards is all I'm saying. It sounds like a good idea to me. I'm just posting to point out that, as you note, "we're a professional site. People in the US/UK/EU and other places are proficient at English" — and people elsewhere are proficient at other languages. That is, we're not aiming our text at children; thus, we don't need to pay attention to age/grade level specifically. The things that confuse foreigners are different from the things that confuse children. Let A be the number of words in the passage. Let B be the number of common, short words ("miniwords") in the passage. "Short" means it has no more than three letters. "Common" means… I don't know what it means. But examples given are get, go, lot, by, for, it, he, the, a, and of. Let C be the number of sentences in the passage. You must not post your thoughts without facts. All answers must be based on facts. To learn more, see our tips on writing great answers. That has 59 words, 25 miniwords, and nine sentences, for a score of 9.3, an improvement on the original (in EFLAW score, anyway). It has 95 words, 41 miniwords, and five sentences, for a score of 27.2, "a little difficult". I'm not sure why this question was migrated to meta.SE because it feels extremely specific to Stack Overflow and the challenges faced there. Stack Exchange's diaspora of sites will have different rules and requirements per site and as such, I will be responding as if this question was on meta.SO. The very fact you think that is part of the problem. If there is any fault, it's shared. Blaming only the creators and curators of Stack Exchange sites for the hordes of poor-quality content is offensive and, to put it bluntly, takes a massive dump on our efforts. Stack Overflow is a site about computer programming. The lingua franca of programming is English. Ergo, competency in the English language is a fundamental requirement for participating in Stack Overflow. I'm not talking about 3rd-grade English competency; I'm talking about the type of competency required to read and comprehend technical articles and examples and API references. Stack Overflow is a question and answer site for professional and enthusiast programmers. A professional and/or enthusiast programmer is, to my mind, the kind of person who, regardless of language barriers, will take the time and effort to learn English well enough so that s/he can be competent in her/his field. That we have a significant number of high-reputation, well-respected users on SO whose first language is not English lends credence to this theory. The problem that you are obliquely trying to address here - hordes of low-quality questions from "Elbonians" - is not one that can be solved by Stack Overflow. Because the problem is not the language barrier, but a clear and present lack of effort and basic understanding on the part of said Elbonian questioners. You have nothing invested in Stack Overflow, you just want to get your question answered. You're probably on a schedule. That is the exact opposite of a professional and/or enthusiast programmer. That is a person who doesn't give two s**ts about anything except getting a solution to their current problem. That is a help vampire. That is not the type of person we want on Stack Overflow. Because they will inevitably ask poor questions, which will inevitably receive poor answers, or just get closed. All of which lowers the site's overall quality and helps nobody in the long run. When in Rome, do as the Romans do. Stack Overflow Romans are ones that make a conscious effort to ask high-quality questions and provide detailed answers. Elbonians... generally don't. That's a culture difference, and Stack Overflow can't hope to change the culture of an entire country. I agree that making things simpler is a good thing. However, one thing to take into account is what the English is like in the things we write on this site (i.e., our questions and answers). As an experiment, I opened up a Meta tab in my browser and took the body of the first 4 questions plus this one, for a total of 5, and put them into the readability site. This is what I got (showing the average grade level for each post). I realize that some of these are featured posts that tend to wax eloquent sometimes. I also realize that this is Meta. But the point still stands that we don't write at a 5th grade level. Those 5 posts average out to be a ninth grade reading level. I know that the Antarcticans just want their questions answered and anything we can do to help them is good. I think we just need to be aware that the answers they get may not be at a 5th grade level and that they will need some command of the English language to understand the help we give them. It would be interesting to run this against a sampling of answers from the main site. First thing, I am not a native English speaker. And even though I hear/read English a lot, my command over the language is average at best. I can understand the reasoning behind this idea. But I don’t think it is good. Let’s forget Stackoverflow for the moment. You are a programmer. You will have to read official documentations, blog posts, articles written in exemplary English to earn your bread. And there is no better way to improve your language than to use it. If Stackoverflow makes me read good English, then I am all for it. More importantly, Stackoverflow is a site for programmers and only need to be accessible to programmers. And a programmer who is good enough to read Official documentations can read the texts on Stackoverflow. The solution is to make user read the texts, that most people don’t do. See, I had to write all this, in English. Put that pop-up text in the help pages, and do simplify it some—not quite as drastic as the example offered. There are a lot of native English speakers that have on par, or less, of a grasp of English than Elbonians. The problem is not just restricted to nonnative English speakers. I work in a pseudo-technical field (supposed to be technical) and find that many people reading what I write (emails, technical documents, etc.) have low literary skills, don't care to read, and/or find it offensive if they have to read more than a few lines. It's quite challenging. It seems that ultimately, I have to figure out if I want to be right or be effective. A former boss told me that my communications with our clients was too complicated, and to dumb it down to about 6th grade level. That's the 6th grade level of what the OP is asking/pointing out. I think dumbing down any of the SEs down too much will defeat the purpose and value of the individual SE. Maybe SEs could implement some sort of accessibility feature that explains the reading level required for each Q or A as a sidebar to let people know what they are getting in to? Not the answer you're looking for? Browse other questions tagged discussion languages rules . The pro forma comments come across as quite blunt - could they be changed?